Researchers and Affiliations: Michael Bevis, Abel Brown, Eric Kendrick, Jason E. Box, Dana J. Caccamise II, Hao Zhou, Jian Wang, Terry Wilson, and David Bromwich of Ohio State University; John Wahr of the University of Colorado; Shfaqat A. Khan, Finn Bo Madsen, Per Knudsen, and Rene Forsberg of DTU Space at the National Space Institute in Denmark; Michael Willis of Cornell University; Tonie van Dam, and Olivier Francis of the University of Luxembourg; Bjorn Johns, Thomas Nylen, Seth White, and Jeremy Miner of UNAVCO; and Robin Abbot of Polar Field Services. 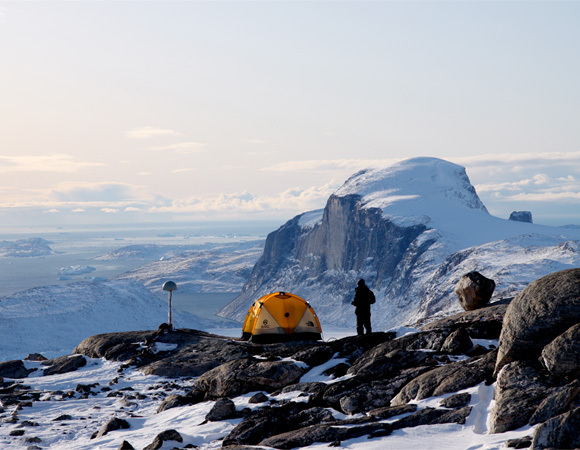 Snow and ice melts in Greenland every summer, but the summer of 2010 melting season was so much longer and hotter than in previous years that an extra 100 billion tons of ice melted from the ice sheet and flowed out to sea. 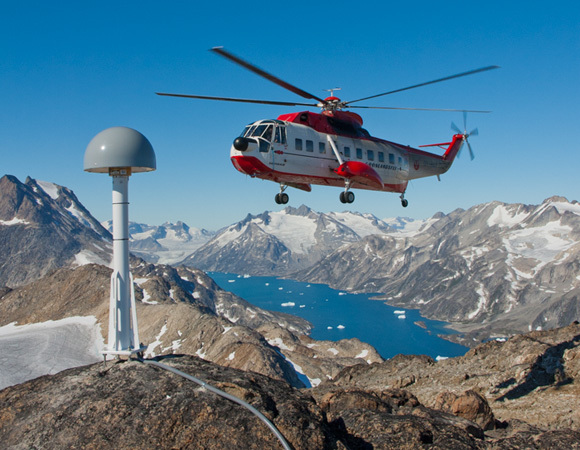 GPS measurements captured the extra or anomalous uplift of the bedrock in response to the greater than normal summer loss in ice mass. 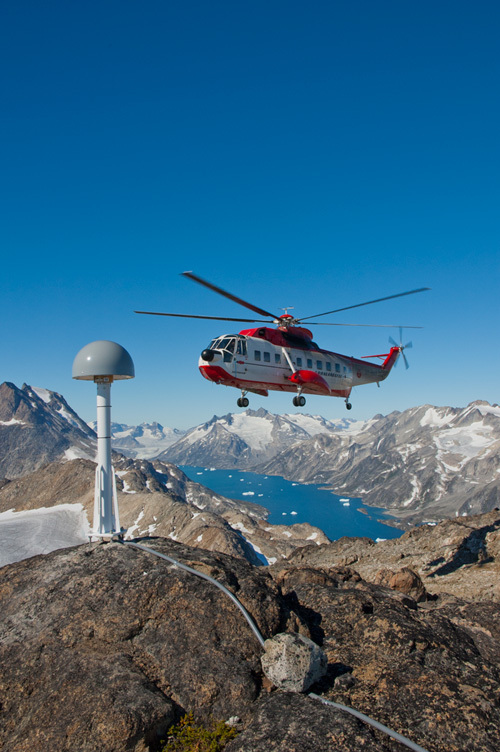 These observations advance our understanding of climate change, sea level change, postglacial rebound (PGR), and the interactions between the atmosphere, cryosphere, and lithosphere. Greenland is covered by a massive ice sheet that is melting faster than it did decades ago because the ocean and the atmosphere is getting warmer. 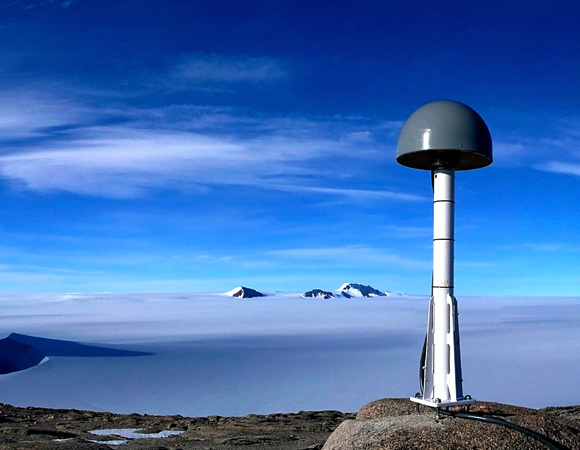 Ice mass oscillates in response to net ice loss in summer and net ice accumulation in winter. Year after year the summer ice loss is greater than the winter ice gain, and so the total ice mass declines every year. 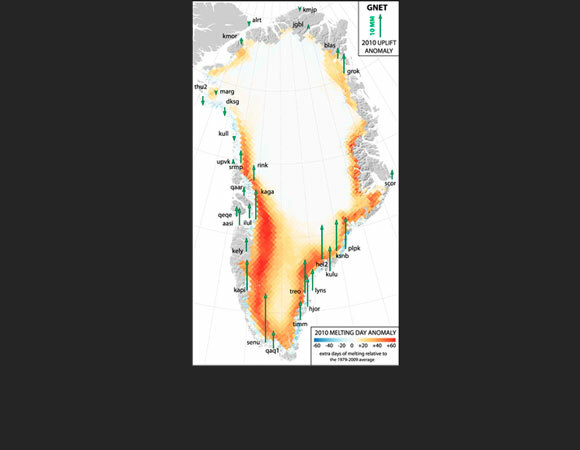 In some areas of Greenland this net annual ice loss has been accelerating. 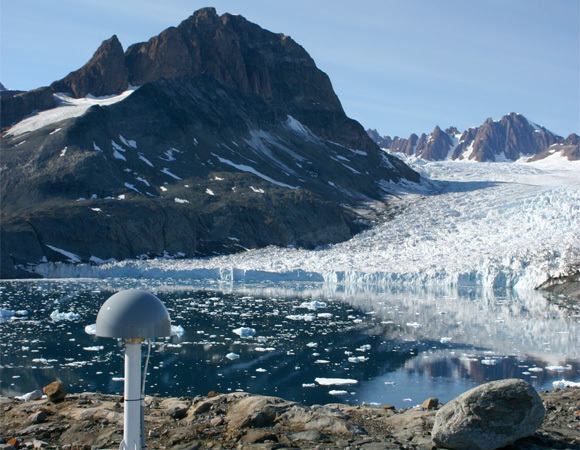 The Greenland GPS Network (GNET) records the rise and fall of the bedrock beneath the ice related to annual ice mass changes and to longer term changes. The annual vertical changes are driven by seasonal variations in ice mass. 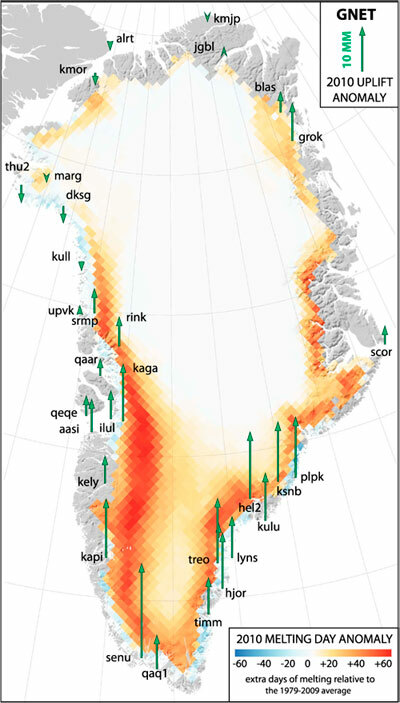 Interestingly, the GNET measurements show that seasonal variations of the air mass above Greenland also affect the rise or fall of the bedrock and thus need to be considered. The multiyear trend in uplift of the bedrock is mostly due to Earth’s elastic response to the extra melting of ice mass due to a warming planet, though GNET is also recording a smaller component of uplift due to longer term PGR. In 2010, an extra 100 billion tons of ice melted in the extended melting season (~6 months), and most of that melt water flowed into the ocean. Researchers measured changes in the height of the bedrock during this rapid event and found that the bedrock rose an extra ~6 millimeters on average, though this amount varied from one part of Greenland to another. Parts of Greenland which had many more days of extra melting (relative to a typical summer) had larger 2010 uplift anomalies, and areas with few or no extra days of melting had smaller or no uplift anomaly. 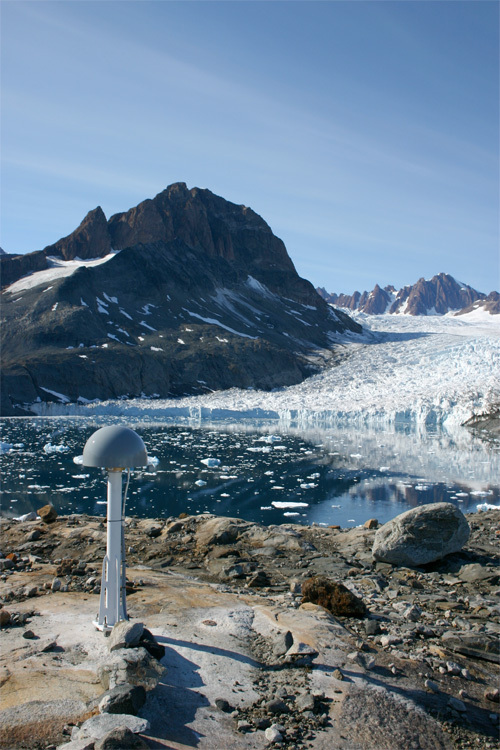 The high precision and dense network of GPS stations, along with satellite observations and seismic instruments, will help to determine both cycles and trends the total mass of the Greenland ice sheet; assess the rate of postglacial rebound, which in turn is used to correct satellite observations; detect and help quantify abrupt changes related to climate change; and understand the intricate interactions of the atmosphere, cryosphere, and lithosphere in more detail than previously possible. 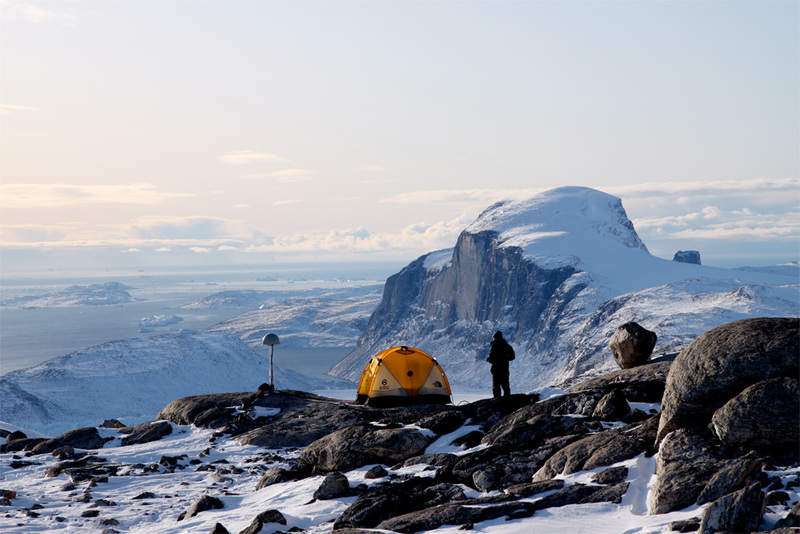 Bedrock displacements in Greenland manifest ice mass variations, climate cycles and climate change, Michael Bevis et al. PNAS 2012 109 (30) 11944-11948; published ahead of print July 11, 2012, doi:10.1073/pnas.1204664109.